I’ve been loving the combination of zucchini and corn. As these vegetables both seem to be in peak season, their flavors are primed for blending. And what better way to blend than with a soup. 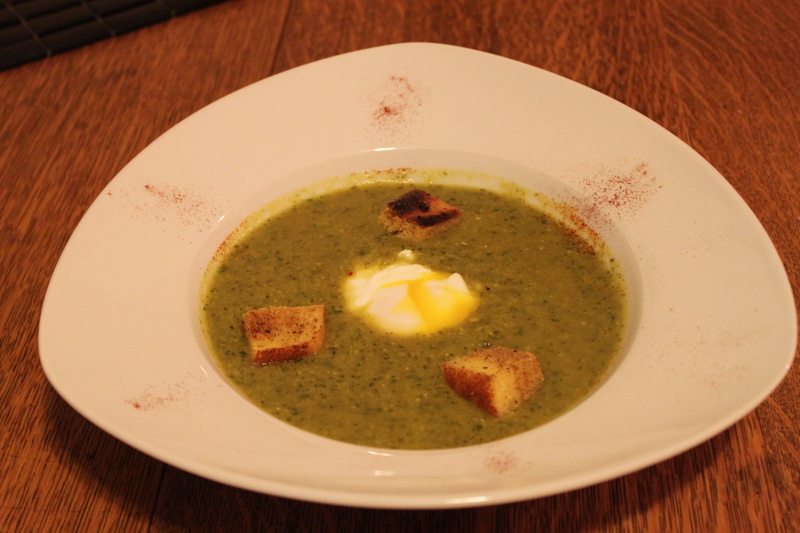 With the addition of onion and garlic along with some curry powder and spinach for color, this soup developed such a fantastic balance of sweetness and savory flavors that I could only wish I had made more. But good soup needs a garnish. And what better to play off that sweetness than with savory jalapeno corn bread croutons? Corn bread is one of my favorite things to make because of how easy it is. Plus the prep and cook time is minimal. But the main ingredient to a delicious corn bread (at least in my mind) is the hold back on the sugar. Let fresh corn bring the subtlety and add some spice or creaminess with jalapenos or cheddar cheese. But even with the corn bread croutons, there was something else needed. A running yolk poached egg added the richness that was missing and trust me, we pretty much devoured this meal. But we couldn’t help but think (and voice) how “breakfasty” it seemed. Now it wasn’t my intention to make a breakfast soup but there is no question: I would definitely have to put this on my brunch menu. Now all I need are those investors…any takers?